With Rahul Dravid appointed captain for the next two series it looks as though Sourav Ganguly, the so-called "Prince of Calcutta", has made way for one of the game's nice guys. Ganguly helped turn India from under-achievers into a competitive outfit, but Dravid's appointment suggests a new style of leadership. The haughty Ganguly appeared, from the outside at least, to be an autocratic leader, while former team-mates of Dravid expect his style to be markedly different. "I expect he will make a very good captain and I'm not sure why it's taken so long (for him to become India captain)," David Fulton, who played alongside Dravid for Kent in 2000, told BBC Sport. "People have their own opinions on Ganguly - I'm not Ganguly's biggest fan personally - but I think Rahul is much more of a team player. "He's a gentleman. He's softly spoken, intelligent and very humble and he took a real interest in everybody in the Kent team. He's just a fantastic bloke." Fulton's view on Dravid is echoed by current Scotland captain Craig Wright, who played Totesport League cricket with Dravid two years ago. "He's one of the nicest people I've met in the game. He's a very loyal person and I wish him all the best. I think he'll do a great job," Wright told BBC Sport. "I've never met Ganguly but Rahul is certainly a different character to how Ganguly comes across. "Rahul is quite a relaxed character. I think he'll talk to people and perhaps be one of these captains who likes to lead by example. "I think he'll be very much focused on the team approach." 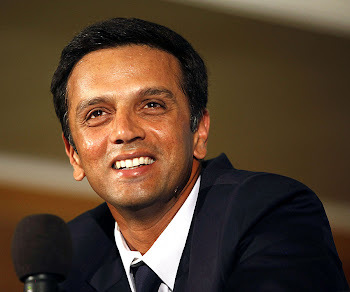 But Dravid's easy-going nature can be deceptive - he is also resilient and brave. "I remember him playing Andy Caddick at Bath, when there was a bit of a ridge," said Fulton. "Caddick was hitting all of us on the gloves and he batted and I think got 90. "He was there for what seemed like hours, fending it off and battling, and he has that side to his game as well - it's not all wristy shots and effortless grace, he has a real inner steel to him as well." You need more than just a winning smile to play a remarkable 91 Tests in a row, as Dravid has. The 32-year-old has already led them as a stand-in captain with mixed results in five Tests and 17 ODIs, but he will be under enormous pressure as India's full-time captain. The Times of India wrote: "Only two jobs are of any consequence in India. The prime minister's and the cricket captain's." And in a country of a billion cricket crazy people there have already been signs of unrest, with angry fans in Ganguly's hometown of Calcutta burning an effigy of chief selector Kiran More. What is not in doubt is Dravid's ability as a cricketer and his standing among his fellow players. The cliche may have it that nice guys finish last, but don't bet against Dravid succeeding in probably the toughest job in the game.